The Phillies knocked off Atlanta again on Saturday night at Citizens Bank Park, 8-6. The win marks the first time since 2011 that the club has won the first two contests to open a season. The obvious highlight came in the seventh inning when Bryce Harper crushed a Jesse Biddle pitch into the second deck in right-center field. It was his first homer in a Phillies' uniform and electrified the sellout crowd. “His bat speed is just lightning,” Phillies manager Gabe Kapler said. A curtain call followed the blast with Harper shouting, "Let's [expletive] go!" The entire offense played a role in Thursday's win, and that was the case on Saturday as well. Maikel Franco homered again, becoming just the sixth player in Phillies history to homer in each of the team’s first two games of the season - Ryan Howard being the last to do so in 2010. He also drove in three runs in the contest. 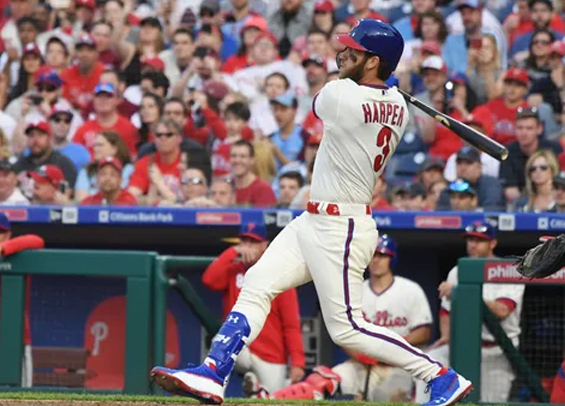 Kapler noted prior to the season opener that there are at-bats to be earned at third base, and so far Franco is putting on a strong showing to stay in the starting lineup. David Robertson surrendered two runs on Saturday via a walk and two hits. He also gave up a run in Thursday's season opener and is now sporting a 13.50 ERA to go with a 3.00 WHIP. The rest of the bullpen on Saturday combined to toss 3 1/3 scoreless innings without surrendering a hit. Kapler wants to see aggressiveness on the basepaths, but the Phillies made a pair of blunders on Saturday with Jean Segura making the third out on an attempt to move to third base on a fly ball to left, and Cesar Hernandez stealing second base with two outs and the eight-hole hitter in Franco at the plate. "I'll make this simple, there are some communication issues we need to clear up," Kapler said. "That's my responsibility." The Phillies will play host on ESPN's Sunday Night Baseball for the first time since September of 2011. Jake Arrieta will make the start, opposing prospect Kyle Wright.